On the seventh Golden Boy episode, we see the focus shift from the titular lead William Clark (Theo James) to a supporting character, Deb McKenzie (Bonnie Somerville). It certainly is a good thing to branch out the show to involve other characters. One wonders whether having the show look at the lives of different characters earlier might have saved it from cancellation. McKenzie on Fire is a showcase for Somerville's character, and a well-crafted episode. So, why did I make it the weakest Golden Boy episode since the pilot? Commissioner William Clark (Theo James) is comforting a female officer after she kills her first criminal. This takes us back seven years when we come across a murder on a subway. One victim is dead but another, Angie McGuire (Elizabeth Alderfer), the other victim's sister, lives. We get a twist in that the casings from the crime scene match the ones that killed McKenzie's brother years earlier. This could be the clue that brings his killer to justice. Detective Owen (Chi McBride) advises caution and a steady hand in investigating both crimes (the subway shooting and Officer McKenzie's murder), but by this point we should know no one at the 39th Precinct ever listens to him initially. McKenzie and her ex-cop father Ed (John Finn) now want to bring down the perpetrator and bring justice. As can be expected Deb McKenzie starts losing focus to where the actual crime being investigated, that of the shooting at the subway, is almost lost to her. We find that the victims are actually connected to a group of Irish and Irish-American mobsters (an old vendetta I think), though the McGuire Sisters themselves were not part of the Gaelic Mafia. We also find that the McGuire shooting is connected to the McKenzie shooting in that the criminal is involved with both. Devlin Lehane (Kevin O'Donnell), the likely suspect in the shooting, assaulted Angie the same night of McKenzie's brother's murder. Eventually McKenzie thinks of taking things into her own hands, but Clark is there to stop her from doing something she'll regret. However, Devlin is caught with his own words about both crimes and the McKenzies can find peace. 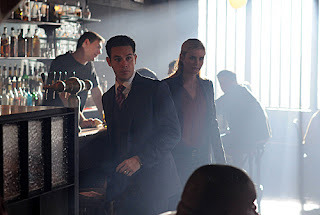 That also means that she ends her affair with her partner, Christian Arroyo (Kevin Alejandro). What I liked about McKenzie on Fire was McKenzie. Everything else I found weak and a little clichéd. We've got an awful lot of coincidences in Christal Henry's script. What are the odds that Devlin (a name to be played with) would have shot McKenzie's brother THE SAME NIGHT he had raped Angie? What are the odds that these two cases would tie together so neatly? In a city as large as New York, what are the odds that Angie would see Devlin and/or vice-versa so soon after coming back? You've got the vengeful father who is also going to take the law into his own hands, the highly-pressured daughter, a lot of things that seem to almost happen just to have a story. I think it would have worked better if the crimes WEREN'T connected because it seemed a bit too pat to have them both join up. Not only that, but the whole Irish Mafia thing made it almost look like we were slipping into The Departed: The Series. Irish mobsters? The McGuire Sisters (again, a poor choice of names) being connected to some sort of Gaelic blood-feud? Is it me, or is it getting a tad ridiculous? Finally, and this was a biggie for me, WHY was Detective McKenzie working on a case where her emotions were getting the better of her? I don't know police procedures, but I do wonder why no one ever stopped to say, 'McKenzie, you're too close to this. You need to be off the case.' No one apparently thought to pull her off both investigations. If I were investigating my brother's murder, I might forget myself (and McKenzie clearly did), but not once did anyone appear to say that she shouldn't. Instead, sometimes it almost looked like she was being put in charge of the investigations. It just never made any sense to me. Again and again I questioned why McKenzie is let in on this case, but I never got an answer. I found it all so puzzling, bizarre, and ultimately unrealistic. In terms of acting I thought Somerville especially did her best work in an episode that failed her and her character. I can't remember anyone else, even the titular star James. They were there as a supporting cast to McKenzie, and it is nice to see Golden Boy opted here to give someone else the limelight for a bit. Personally, I found Somerville excellent in McKenzie on Fire. Everything and everyone else, however, makes this episode a flame-out.